I should start this post with a caveat that I am neither a scientist nor a science educator, but I would make the case that I am scientifically literate. There are two issues that I want to discuss here; scientific knowledge, and scientific literacy. Both are different, yet both are related and both are disturbingly low. 45% don’t know how long it takes the sun to go around the earth. 1/3 believe astrology to scientific or somewhat scientific. (on an entirely personal note i do find it refreshing that belief in science and belief is god are no longer mutually exclusive and 38% of Americans believe in evolutionary theory and believe in a god that played a part in that evolution). Studies like these should make science educators squirm. Why do 37% of people with college degrees believe the world was created in the present form less than 10,000 ago. How have college graduates not learned science? Well I don’t blame the students. It’s too easy to sit back and say “ha ha Americans are stupid” (don’t fool yourself to think Canadians do that much better in science). It is the fault of the education system. Why blame education? Well this is my theory (and I admit it is easier to blame science education than take personal responsibility by I will still voice my theory). Science education in many classrooms has become about learning scientific facts, that is to say rote memorization of scienctific facts, scientific laws, and formulas for working out the mathematics. Students who want to do well on exams have figured out all you have to do is memorize the formulas. Many (not all) classes are set up to encourage no critical engagement (see my earlier post where a Harvard Physic instructor figured out his students could learn all the newtonians laws but could not critically evaluate the world in a newtonian way). Students can reproduce memorized facts, but are unable to internalize the knowledge and do not let it influence the way they think about the world. For many students science has become a series of memorized facts, rather than a way to look at the world which profoundly influences our understanding of the world. So I propose that the disturbingly low knowledge of basic scientific facts, while truly disturbing, is far less so than the fact that most college graduates are not scientifically literate. I have met science majors who are not what one might identify as scientifically literate. It is a sad fact. Students are able to get a BsC without understanding how the scientific method works, without understanding how to conduct and/or critique an experiment or or a methodology. What I am basically saying, and many have said this before me, is that our education system is failing our students. Not because it isn’t teaching them anything, but it is teaching them easily forgettable facts. If only our education system focused much more teaching students transferable skills, such as critical thinking. We might not have these problems if students left school not having memorized the periodic table or important physics formals, but rather if they left high school with the ability to think critically about science and about the world we live in, and better yet if students left if a profound curiosity to learn more about the natural world. I wanted to write at least two blog posts a week when I started this. I thought that it was a realistic goal. It turns out that between working full time and finishing a graduate degree that even once a week has turned out to be difficult. I am hoping to keep this going and I will hopefully have more time to put thought and time into this blog after I finish my degree. I have had 3 major assignments due in the last week, and went to the Netspeed conference in Calgary. Those things have kept me pretty busy. I’ll come up with something interesting to post soon. I promise. 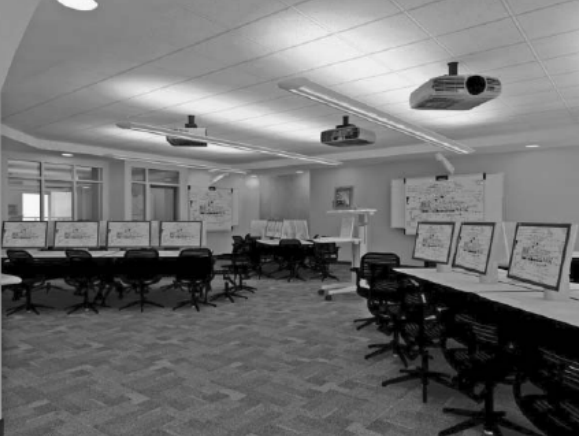 Pedagogy and Classroom Design: Strange Bedfellows? As I mentioned in my previous post, pedagogy has been at the forefront of my mind the past while. I want to post about a little brainstorm I have been having about the relationship between classroom design and pedagogy. It had never really occurred to me that architecture and the design of physical spaces would ever be influenced by or influence pedagogy. But it only takes a few seconds of thinking about this issue to realize they are inextricably linked. Spaces have meaning. Spaces tell us something about what is expected of us in that space. Think about the message sent by a traditional classroom. There are seats all facing the front, and there is a space for the teacher at the front of the class. This is a teacher centric model of classroom design and it sends a clear message. Forgive me for being blunt, but the message this traditional classroom sends is “sit down and shut up.” It is a listening space. Technology has not improved the situation. The traditional teaching computer lab that most librarians teach in is the same thing. Rows of computers that all face the front where there is one projector. It is not a flexible space. It is created for a single purpose, lecturing with all eyes on the teacher. Try incorporating cooperative learning while teaching from a computer lab, and you will see how inflexible the space is. The teacher struggles to maneuver around the long rows, and students cannot really face each other and discuss things while still using the technology. So, even though I haven’t come to any firm answers, I have been thinking/reading about how we can design spaces that send the message of collaborative learning, that tell students to engage and discuss rather than sit and listen. I have seen some very cool solutions (although sadly most aren’t cheap). Pods are an interesting design as the students are all facing eachother and already formed into natural groups. This space sends the message that students should be working together. 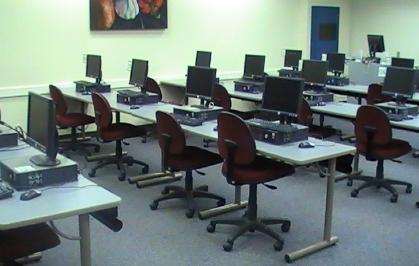 Unlike the traditional computer lab this space encourages collaboration, and allows the instructor to circulate and assist students with their collaborative efforts. But on the flip side this is not a very efficient use of space, and might meet resistance from an IT department that will want the lab to be used as a drop in lab when not booked for teaching. 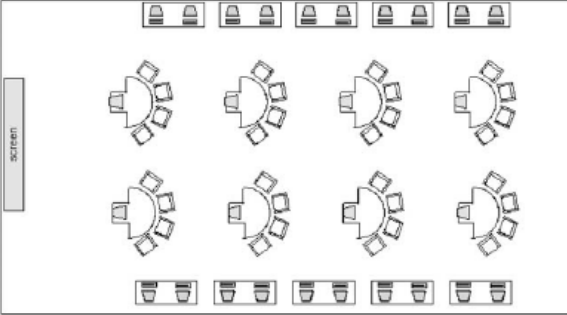 Waves or curved desks are another way to organize a space as it forces at least 2 students to be facing each other. This too also isn’t a perfect solution but as it still forces the instructor to awkwardly slide between long curvy rows, but at least the design gives a collaborative message to students. Smith, S. A., (2004). 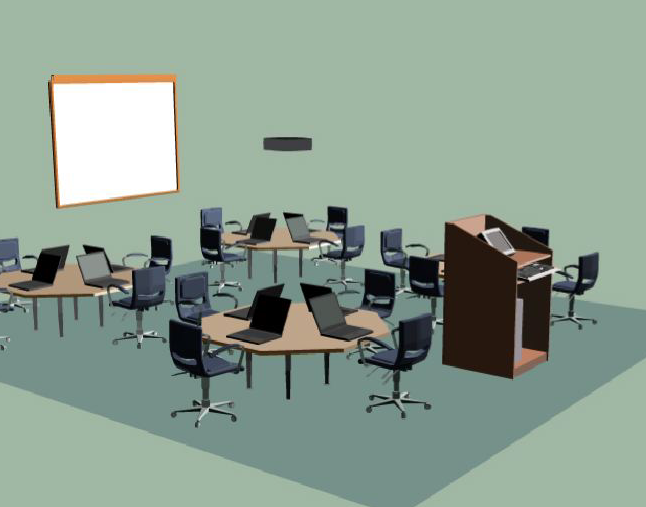 Designing Collaborative Learning Experiences for Library Computer Classrooms. College & Undergraduate Libraries, 11(2): 65-83. Doan, T., & Kirkwood, H. (2011). Strategically leveraging learning space to create partnership opportunities. College & Undergraduate Libraries 18:239-24. This space has no obvious front. It is not a lecture space, but rather specifically built as a collaborative learning space. This lab does not work well for lecturing, but sends a clear message to students that the teacher is not front and center but rather a facilitator of learning who is constantly circulating to assist in collaborative learning. I apologize if this got a bit long or if my thoughts are not perfected on this topic. But these ideas have been floating around in my brain for a while and I wanted to get them down. I just really think that with so much talk about constructivist teaching philosophies and the importance of active and collaborative learning, we could do so much better in designing classrooms that encourage this sort of learning. I recently watched this video, which explains why students do not learn from lecturing at them in an attempt to dump information directly into their brains. He explains the importance of peer education. Anyone involved with education, or an interest in pedagogy should watch this video. Pedagogy has been on the top of my mind the past few weeks since I started teaching information literacy sessions for my new job at Concordia University College of Alberta. With so many other responsibilities (the library’s websites and collections) it is has been hard to resist the temptation to just lecture. It’s so easy to prepare 45 minutes worth of material on searching, evaluating, and/or citing information. But I know that I never learned well that way, and I know it doesn’t work. I see the students eyes glazing over. This video helped to reminded what I have known for a long while. I need to start incorporating more active learning and cooperative learning into my information literacy sessions. I call myself a constructivist as far as teaching philosophy goes, and I need to start putting my money where my mouth is. I should give credit where credit is due, I found this video on Dwayne Harapnuik’s blog, Dwayne is the VP academic of Concordia University College of Alberta. Corporate Sponsorship: is it the future of libraries? Library Website Design: What labels do you use?